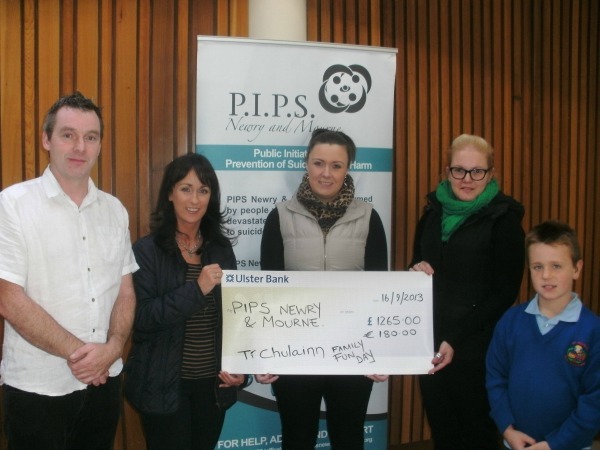 TI CHULAINN Family Fun Day 2013: Kathleen McGinley, Dearbhail Walsh, Laura Reel and Shea McKinley (Soap Box Racer) present a cheque for £1,265.00 and E180.00 to Eamon Murphy PIPS Newry Volunteer. This fantastic total was raised by a massive community effort at their fun day. A big thank you to everyone for organising and taking part in the many activities throughout the day, from all at PIPS Newry & Mourne.